Below is the academic year 2011-2012 racing schedule for Case Crew with links to the results and photos for each event. For a write up about each event continue to scroll down. DelBarba National Champion in the Men's Single! May 26-27, 2012: Case Crew scullers Patrick DelBarba and Doug Brubaker headed south to Gainesville, Georgia for the annual American Collegiate Rowing Association (ACRA) championships on Lake Lanier. First year student DelBarba took home the gold and is National Champion in the men's single. Third year student Brubaker finished in 5th in the B final for 13th place overall. The total event had 23 scullers from around the country entered. The format followed a progression with heats, reps, semis and finals. With two boats advancing out of the heats, and Patrick took second to advance directly to the Grand Final while Doug finished 6th and had to progress through the reps and semis. In the 8-boat final Patrick bested scullers from Virginia Commonwealth, Pittsburgh, Cincinnati, Minnesota and Virginia with a time of 7:20.7. The regatta course on Lake Lanier hosted the 1996 Olympic Games and is in the second year hosting the ACRA championships. The ACRA championships is the national championship for club rowing programs. A few years back IRAs excluded club programs and the top clubs in the country then created the ACRA race as their national championship. Patrick DelBarba (left) with his medal and national champion plaque with Doug Brubaker (right) holding all of his betting shirts from the victory. After Patrick and I both got knocked out in the semi-finals at the Dad Vail Regatta, we both wanted another crack at those scullers. With Dad Vail being my second race in the single I wanted more race experience, and having posted the third fasted time overall but failing to advance to the finals, Patrick had some unfinished business. ACRAs had the Dad Vail second and fourth place finishers entered as well as a number of scullers we hadnâ€™t seen before, so we saw an opportunity for some good races. Besides, racing on the 1996 Olympic course was an amazing opportunity that we really couldnâ€™t pass up. The Saturday morning heats were rough for both of us. Patrick came in second in his heat with a fairly slow time for him, but good enough to advance to the finals directly. Having smacked into the buoys at the start, I had a lot of ground to make up and finished in sixth, good enough to go the repechage that afternoon. The day ended with Patrick seeded 5th in the Grand Final, myself seeded 5th in the B Final. Sunday morning brought clear skies, but rough water and a few of the scullers struggled with the chop. Our races were back to back, mine before Patrickâ€™s. Patrick sat off to the side in his boat while I took off at the start. My race had Kansas State and he and I had battled it out the day before in a pretty tight race. This one was no different. At the 500 meter mark he and I were dead even, but I pushed hard and took him by half a second. Afterward, I paddled off to the side, up to the 200 meter mark to watch Patrick come down. The race commentator was going through the positioning, and for most of the race Patrick was in third by roughly a boat length with the Dad Vail second and fourth, University of Pittsburgh (Pitt) and Virginia Commonwealth University (VCU) battling for first. This was tough to hear, but around the 750 mark when the racers came into view, things began to change very quickly. Pitt and VCU had tired each other out in the chop and when it became clear they werenâ€™t going to pull away, Patrick made his move. By the 500 he had begun to lengthen out and put on the power, taking water on Pitt and VCU with each stroke. By the 300 he was dead even with them, and then proceeded to walk right past them, crossing the finish line by a boat length! It was incredible to watch, both the dramatic ending to the race and to see a Case boat take first at a major regattaâ€¦I really wish the rest of the team could have seen it because I wonâ€™t ever forget how awesome it was. All in all, I think we both got what we wanted out of the weekend. I feel as though I improved as a racer and Patrick got the race he should have had at Dad Vail. It truly excites me, looking at where we are, where the novices, now varsity members are at this point. The team has come so far this year, growing both in size and competitiveness. I absolutely canâ€™t wait for next year, because I know we can and will continue to grow and that Case Crew will be a team to reckon with. May 18 & 20, 2012: Case Crew alumnus Paul Buchheit '98 and his wife April came into Cleveland for commencement weekend. The university asked him to be the keynote speaker at graduation and the current team members took the opportunity to invite him for a row and out for drinks afterward. Paul looked like an old pro after being away from the sport for a few years. April had never tried the sport before, but both hopped in an 8+ with current team members to paddle up and down the Cuyahoga. After a while April swapped out with a current team member and the 8+ did a little pressure work against a men's quad. Paul rowed an undergrad and has been an avid supporter of the team and SARA ever since. The weekend coincided with the announcement of his latest major gift to the team to set up a coaching program next summer. You can read the official university press release here (html) or here (pdf). Click here for tons of photos from the Paul & April's practice with the team. May 11-12, 2012: Case Crew sent it's largest squad ever to this year's Aberdeen Dad Vail Regatta -- a race that serves as the national championship for small universities. The city of Philadelphia and the Schuylkill River hosted 127 colleges and thousands of athletes for the 74th edition of the "Vails." The team entered five boats into this year's race: women's varsity pair, two men's singles, women's novice 4+ and men's novice 4+. This was the first time ever that the team sent multiple boats to the event. Heats are always held on Friday and the major goal for most programs is to experience Saturday racing in the semi-finals and then hopefully the afternoon finals. Crews that made the Saturday semis were Caitlin Bowerman and Mallory Miller in the women's pair along with Patrick DelBarba and Doug Brubaker both in the men's single event. The men's and women's novice crews finished agonizingly close to Saturday racing by taking third in their heats. However, it was only the top two to advance leaving them hungry for next season. 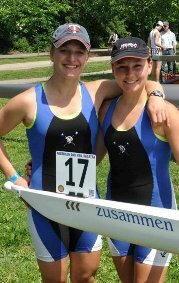 Caitlin is a veteran of Vails finals having teamed up with Katie Puttmann '11 last year to take 6th overall. This year she found a new partner and the pair have been training all year with the Vails finals in their sights. Sporting a new women-specific Pocock shell the pair advanced out of the heat relatively easily even after a relatively unclean start. Their time was the 5th fastest overall coming out of the heats. The real excitement was held for the Saturday morning semi-final. Case drew lane 5 with Loyola College from Maryland in Lane 6. The Philly 2000m course is not straight and the higher number lanes have a tighter bend, which Loyola failed to execute. The result was a collision with our Case women bringing things to a halt for nearly 20 seconds. Caitlin and Mallory finished the course and immediately protested the interference and not being able to contest the final. The referees upheld the protest and Case was allowed to have Lane 0 in the final for 7-across racing! A few hours later Caitlin and Mallory were gearing up for the race of their life in tough Lane 0. They would be racing within feet of the grandstand and the roaring support section. Their time of 8:47.4 was good enough for 5th overall and was vindication for their place in the final by finishing ahead of varsity status programs from Nova Southeastern and Stetson. Overall winners were UMass who finished an impressive 26 seconds ahead of our women. Our next semi-finalists both came out of the same event. Typically schools are not allowed to enter multiple crews in an event, but the men's single is classified as an "exhibition" event. Freshman Patrick DelBarba and Junior Doug Brubaker have been focusing more on sculling this season and since Vails doesn't offer the double they decided to each enter a single. Both scullers finished second in their respective heats and lined up for the semi-final first thing Saturday morning. Patrick was dealt an unlucky hand having drawn the fastest of the three semi-finals. Only two from each semi would advance to make a 6-boat final. Unfortunately the two scullers from Oklahoma City University and the University of Pittsburgh would take gold and silver in the event later that day leaving Patrick to watch the race from shore. Patrick actually had the third fastest time overall out of the semi. Unbelievable. Doug put together two fantastic pieces in the heat and semi, but was just slightly off the pace in his semi. He finished 2 hundredths of a second behind the sculler from Colgate to take 6th in his semi and 16th out of 18 in the semis. In the men's novice four, the line up of Evan Lanese, Gavin Brown, Matt Brown, Matt Holdren with Jeff Chin coxing took on a strong field including alumnus and SARA secretary Brian Chorney's Endicott College team from Boston. Also in the heat was the crew from Bowdoin who beat up on our guys over spring break. After spring brink the guys re-doubled their efforts literally taking on two-a-days to gain speed and experience. They got faster, but weren't quite able to match the speed of heat winners Tennessee and Bowdoin. With only the top two crews advancing our guys were shut out this year. However, showing real class the guys from Bowdoin came over to the trailer to congratulate Case and recognize the speed improvement and to say they gave Bowdoin a scare. Much respect. The women's novice 4+ of Katie Kershenbaum, Abby Sevier, Stephanie Merlino, Chloe Milliman and Jamie Shah coxing also took third in their heat and missed Saturday racing. The two advancing crews were from varsity-status programs from Colgate and SUNY Buffalo. A large portion of the team is planning on staying in Cleveland to continue training and many learning to scull. Stay tuned! April 28, 2012: Case Crew travelled west to Grand Rapids, Michigan to compete in the MACRA Regatta hosted by Grand Rapids Rowing Association. The event serves as a mid-spring tune up for large colleges like Michigan, Purdue, Ohio State, Grand Valley, Northwestern and U Chicago and their preparation for Dad Vails and ACRAs. The event features 7-lane 2000m racing with morning heats and afternoon finals. The weather was cold and rainy, but the water was calm making it perfect spring racing weather. Leading the charge for the varsity were juniors Mallory Miller and Caitlin Bowerman in the women's open pair. They beat the University of Cincinnati crew to take gold in their event. Next up on the medal podium was freshman Patrick DelBarba in the men's open single. 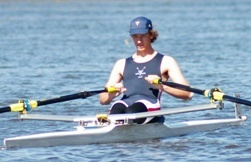 Patrick took home gold by beating six other scullers including his own teammate Doug Brubaker who grabbed sixth in his first ever 2000m sprint in the boat class. The Novice Men's 4+ grabbed the bronze medal for their efforts during the day. The crew of Patrick Delbarba (s), Matthew Brown (3), Gavin Brown (2), and Evan Lanese (b) with Anna Czekaj coxing won their heat ahead of Notre Dame by over 10 seconds. In the final they couldn't quite match the speed of Michigan and Purdue finishing in third two lengths off the winner. This is an amazing achievement for this young crew and bodes well for their appearance at Vails in a couple weeks. A second novice men's four raced in a separate heat, but were not able to qualify for the finals. The women's novice team brought an eight and a four to race. The women's novice 8+ was a final only affair and saw our team lined up against six other Midwestern powerhouse schools. Within a 100m of the start the crew stated overlapping Northwestern and the inevitable clashing of blades occurred. The two crews didn't quite gain their composure after clashing and finished at the back of the pack. There is a nice picture sequence here. Case Crew Women's Novice 8+ (near) just off the start against Northwestern (middle) and GVSU (far). The women's novice 4+ of Chloe Milliman (s), Stephanie Merlino (3), Abby Sevier (2), and Katie Kershenbaum (b) with Ann Czekaj coxing finished 3rd in their heat, which was fast enough to garner a place in the final. In their heat they finished ahead of crews from Northwestern, Cincinnati, Marquette and Xavier. For their final the regatta was running a few minutes ahead and the crew missed the start. Even though they showed up a few minutes early for the start, the dock master failed to check them in and notify the starters. This mishap cost the women a chance at a medal, but will definitely put a focus on the lead up to Vails. Complete race results can be found HERE (html). April 21, 2012: Case Crew headed to Pittsburgh for the annual Car-Du-Pitt scrimmage. The race is very similar to the Cleveland Collegiate Regatta, but since Pittsburgh has wider, straighter water the race can accommodate more crews. This year's event was billed as the Cleveland vs. Pittsburgh (plus Rochester) showdown with all colleges from the traditional Rust Belt towns racing. The team brought most of the varsity and novice squad to the event. The Allegheny River course conditions were flat today and the teams raced with the current. However, a little rain and spring temperatures didn't dampen spirits. First off the blocks were the novice eights. With many of the novice squad starting this spring, the Car-Du-Pitt was meant to gain some vital racing experience before MACRAs and help the coaches select who might be in the novice fours at Vails. The Novice Men's 8+ looked strong and together, but were outmatched by a seasoned crew from the University of Pittsburgh. The Novice Women's 8+ event has five crews entered including varsity programs from the University of Rochester, Robert Morris University and Duquesne University. The novice women held their own, but couldn't quite match the speed of the other crews finishing in 5th place. Since the event was a scrimmage and limited to five lanes, multiple heats were run as finals for the fours. In the women's varsity four, the Case women lined up against Duquesne, Pitt and Robert Morris. They finished in second place behind Duquesne by about 15 seconds. Men's varsity 4+ receiving shirts from Carnegie-Mellon. Last up were the Men's Varsity and Novice Fours. The varsity men challenged Carnegie-Mellon to bet their shirts based on the outcome of the race. It was a great bet, because Case ended up winning by over 15 seconds to Rochester and 34 seconds over CMU. In the last race of the morning the Case novice men won their heat in convincing fashion against Pitt and CMU. Race results can be found HERE (html). April 14, 2012: Students, Alumni and even a couple parents took to the Cuayahoga for 600 meter sprints and bragging rights. With enough rowers to field both women's and men's alumni eights, the event was big, competitive and fun. The day's events included nine races across many boat classes, an amazing dedication ceremony, and an evening of drinks, food, and camaraderie at Great Lakes Brewery. The morning program consisted of three races in pairs and doubles. First off was the men's double which saw the varsity men's top athletes face off against Tim Marcovy and Doug Rathburn. Freshman Patrick DelBarba and junior Doug Brubaker have been sculling the double all season and proved the superior crew over the course from Nautica stage to the boathouse docks -- about 600 meters. Tim and Doug took full advantage of the rule that false starts don't apply to alumni, but it was still not enough with Patrick and Doug B. taking the full advantage back within the first 20 strokes. In the next race student Caitlin Bowerman and alumna Katie Puttmann reprised their 2011 Dad Vail finalist line up in the pair to take on alumnae Patty Travis and Jess Schneider in the double. Yes, pair against double! Coming in front of the boathouse Caitlin and Katie looked in control, but a wide turn made the final result less than a length in their favor. Alumni men's 4+ of Tom Hudak (s), Chris Shoemaker (3), Dan Bachmann (2), Nate Uber (b) and Jess Schneider (cox). The final small boat race pitted current varsity pair Caitlin and Mallory Miller against sorority sisters Laura Kruse and Abby Sevier both in pairs. This was Abby and Laura's first race in the pair after an initial practice a couple days before (click for some cool photos of their practice). The inexperienced pair put up a valiant effort and had a lot of fun, but ultimately the more experienced crew of Caitlin and Mallory won by open water. There were two races in the men's fours. The first race saw a strong alumni crew of Tom Hudak, Chris Shoemaker, Dan Bachmann and Nate Uber fall by only a length to the men's varsity crew of Patrick DelBarba, Doug Brubaker, Matt Moss, and Jeff Chin. In the second race the father-son duo of Brian and Patrick DelBarba sat stern pair with novices Matt Steadman and Larry Muhlstein. They raced the mostly novice crew of Matt Holdren, Matt Brown, Doug Brubaker, and Evan Lenase who ultimately prevailed by open water. Alumnae Women's 8+ cruising to victory. 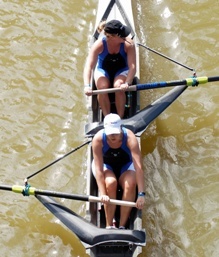 Two fours races were held on the women's side as well. First up was the alumnae crew of Miranda Cullins, Sarah Rubin, Lauren Boucher, Jessica Schneider with Katie Menosky coxing against the varsity women's four of Mallory Miller, Caitlin Bowerman, Ruth Dickey, Chloe Milliman with Anna Czekaj as cox. The varsity women proved too fast for the alumnae women finishing over a length ahead on the outside lane. In the second women's race alumnae Cheryl Thompson and Patty Travis teamed up with Patrick DelBarba's mother, Caroline, and WRRA rower and CWRU alum Eileen Gordon. Katie Puttmann was at the tiller. Eileen is a Case alumna but didn't pick up the sport until after she graduated and joined the WRRA Summer Rowing League. The alumnae/friend boat bested the women's novice crew of Katie Kershenbaum, Jamie Shah, Ava Kotvas, and Stephanie Merlino by open water. In the eights both alumni crews were mercifully pitted against mostly novice crews. Even though the student crews put up a valiant effort, but the alumni eights won by open water each time. The stability of the big boats helped the alumni crews find their rhythm and both crews looked strong powering down the sprint course. The final mixed eights were scratched due to the worsening weather. After racing concluded everyone gathered for a dedication ceremony for the new women's lightweight Pocock pair. But before the dedication, SARA president Doug Rathburn presented SARA VP Dan Bachmann with a trophy blade to honor his leadership gift to the new Pocock four last fall. Tim Marcovy and Doug Rathburn then christened the new pair the "zusammen." This latest addition to the Spartan Navy resulted from trading in the older positive alpha pair along with cash gifts to SARA. You can see details of the christening here. At the end of the christening, Doug had a surprise announcement for the team. 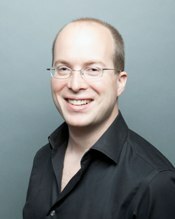 Crew alumnus and benefactor Paul Buchheit '98 has decided to support the hiring of a part time coach for the team. Paul has committed $50,000 to SARA for coaching over the next few years. The SARA board has entered conversations with the university on how the gift and coaching position will be implemented. The intent is that a paid coach will be in place next fall. Case Crew members thanking alumnus Paul Buchheit '98 for his support of the team. At the end of the program all of the alums plus some student guests met in the boathouse boardroom for the annual general meeting. But before the meeting Matt Van of The Jolly Scholar restaurant provided everyone a nice BBQ lunch. 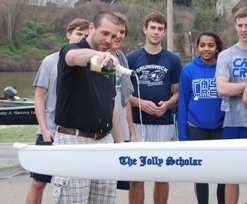 The team recently christened their newest four "The Jolly Scholar" due to the support Matt has showed the team. Those in attendance at the AGM heard details on equipment, fundraising and plans for the coming year. The membership also elected a new member, Chris Shoemaker, to the Board. Minutes of the meeting will be posted soon. Later that evening over 30 students and alumni met at Great Lakes to swap stories of the glory days and plans for the future. Overall it was the most successful event to date, and we hope to see you next year! Special thanks to Danette Bush and Dan Bachmann for sharing so many photos. Take a look at the album below where we've posted over 400 photos from the weekend. Full results and lineups from this year's race can be found HERE (html). Case Crew Dominates the Cuyahoga! 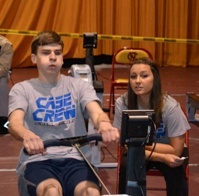 March 24, 2012: Case Crew took on its cross town rivals Cleveland State and John Carroll in the tenth annual Cleveland Collegiate Regatta. The annual challenge pits the three colleges against each other in a heat and final format. Each team races a short 500m heat and the two fastest crews then face off in a longer 1400m race around two bends on the Cuyahoga. The race, formerly known as the Homeschools Regatta, opens up the rower's lungs a bit, provides a early season test of speed for the teams, and helps with coxswain development due to the turns and race strategy. Case women's varsity four on their way to a win against John Carroll. Anna Czekaj (cox), Chloe Milliman (bow), Ruth Dickey (2), Mallory Miller (3) and Caitlin Bowerman (stroke). Here is a Race Report from Anna Czekaj '13 [edited]. She is normally a coxswain, but raced today in the JV 4+. I ROWED (right?? I row too! haha) in the Women's Novice 4 race, which included a heat. With all three boats lined up at the start, we started out slow but within seconds we got the lead. It was a clear win and an amazing effort by all the women in the boat. EVEN After the heat, it was down to JCU and us. Since we won the heat, we took the inside lane which meant prime opportunity for cutting a corner very close. Caitlin Bowerman '13 did an amazing job coxing and we got the lead. We ended the race at least three boat lengths ahead with a margin over 40 seconds. The next race was the varsity men's race, and they looked amazing. You can tell that everyone was following each other and that the pressure was on by the way they sped away from their competition! The best part is that CSU has been practicing this four for more than a semester and they are going to Dad Vails with it and we practiced our Varsity four... once? The Case Men finished the race with two boat lengths ahead. Next up was the women's varsity 4+ where I coxed and a novice rower joined in bow. There was no heat. Our competition was JCU. We had the far lane (without the ability to cut the turn). I had a game plan in mind and just had to make sure the rowers trusted me. The race started. JCU did a high 20 which overpowered our high 10. They had a slight lead but were rushing up their slides like crazy. Recognizing the inefficiency, I this called out for ratio, which instantly caused our boat to react to keep us neck to neck into the first turn. I stayed close to JCU the entire straight stretch down. The power increased as the heels went down into the second turn. We didn't pull away until the last turn. It's a good feeling when the rowers give you what you asked for and we won by almost 12 seconds. After that the men's 8 went. I didn't cox this one, but even though a couple kids in the boat didn't really have much practice in they still won and looked strong. Last up was the mixed 8 with me coxing. On the water we realized that we only had two varsity members in the boat (Caitlin and Mallory) and that everyone else was a novice. There was a heat in this race and we were also rowing the Marcovy, which takes a while to get up to race speed. I knew that in the heat we wouldn't win unless we REALLY got it going. I called for the first five strokes, a high twenty and then a 15 to lengthen. We were in the far right lane, JCU in the middle and CSU at far left. In the start of the race, we were behind. However, after some clashing of oars and poor steering from the other teams we rowed right past them to win the heat. In the mixed 8+ final 1500m race, and the last race of the morning, it was CSU and us. They had 6 varsity rowers and 2 novices. We had a weaker start but that didn't stop us. We had the inside corner, and I took advantage of it. We pulled ahead in the straight stretch and we won by over 2 boat lengths. We finished the race and everyone was happy, and I sang my traditional mixed 8 win song (Build Me Up Buttercup). We sang it the entire way back to the docks. IT WAS AWESOME. After racing concluded the team dedicated their new Vespoli V1 coxed four. The team traded in the Hot Sauce this winter, which was roughly the same shell confifuration but from a previous generation. A new restaurant on campus has been supporting the team with food and refreshments for their events so they decided to name the boat The Jolly Scholar -- the same name as the restaurant. This keeps the tradition of naming after a restaurant, and the restaurant's manager, Matt Van, was on hand to sprinkle Champaign on the bow. Here is a link to more information on The Spartan Navy. As part of the profile she sat down with the editors to answer 5 questions about herself and her time in Cleveland. Anna aspires to hit all seven continents before graduation. 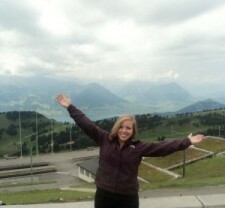 The picture to the right shows her in the Alps around Lucerne, Switzerland. She was in town to watch the 2011 FISA World Rowing Cup. You can read the full profile at the Case Daily HERE or an archived PDF copy HERE. March 10-15, 2012: The team headed south to Camp Bob Cooper near Clemson, South Carolina for a week of warm weather training. The team participated in two and three practices per day in a mix of boats. Both the varsity and novice teams gain valuable miles and near the end of the week they scrimmaged Carnegie-Mellon, Liberty, and Bowdoin. 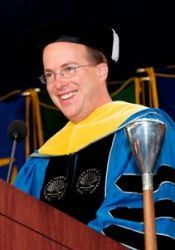 March 1, 2012: Gmail creator and Case Western Reserve University alumnus and rower Paul Buchheit (CWR '98; GRS '98, computer engineering) will speak at the 2012 commencement address May 20 in Veale Convocation Center. 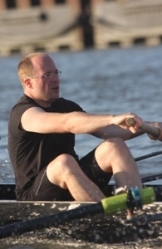 Paul was a rower at Case for two years and has been a very generous supporter of the team and rowing in Cleveland. He provided one of the lead gifts that secured a permanent boathouse for Cleveland in the summer of 2010. Paul has had a distinguished technology career starting out at Intel Corp. after graduating from CWRU. After a year at Intel, he left to become Google's 23rd employee in 1999 where he went on to create Gmail and the first AdSense prototype. After retiring from Google in 2006 he founded FriendFeed, which was later sold to Facebook. He is currently a partner at Y Combinator which provides funding, advice and networking opportunities to promising startups. You can check out a photo of Paul rowing at the 1997 Pittsburgh scrimmage sitting 3-seat in the men's lightweight 4+. You can read the full press release at the Case Daily HERE or an archived PDF copy HERE. I was put in charge of running Case Crew's annual erg-a-thon event held February 24th to the 25th, and I'm happy to say that due to the entire team's hard work and dedication, it was a giant success! We ended up raising over $1800 from donations from friends and family as well as from students on campus. As for the event itself, we brought over six ergs from Veale so students who were interested in the club could try out the rowing machine. As an extra incentive, we offered two gift certificates donated from Guys Pizza Company to the male and female student who had the best 500 meter time. This turned out to be a tremendous success as we had over 20 students who attempted to win the gift certificates. The winner for the women ended up pulling an average 1:54 split and the winner for the men was a 6'7" boy who pulled an average 1:24 split that even impressed Patrick DelBarba (the team's current top erg). We are currently trying our hardest to recruit both these members. The crew club itself came together and managed to pass the entire 24-hour period with at least one team member on an erg. The entire team managed to erg a total of 568,485 meters which is the closest we have ever gotten to our goal of erging to Dad Vails, a distance of 690 kilometers from Cleveland to Philadelphia. Another record that was broken was that we had six members of our team erg a full marathon (42,195 meters), including three novices. Caitlin Bowerman, Patrick DelBarba, Doug Brubacker, Chloe Milliman, Evan Lanese and myself braved the challenge and we are currently planning to do it again next year, but this time with ten people! Case Crew Throws the Hammer Down! 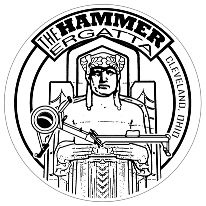 February 11, 2012: Case Crew posted a dominate result in this year's Hammer Ergatta winning the team points honors for Men, Women and Overall against cross-town rivals from John Carroll and Cleveland State. The team overall posted 196 points against 120 for CSU and 108 for JCU. Across the three colleges 18 women and 22 men raced. With the new points system in place since 2010, the team is awarded a point for each person beaten. Therefore, the fastest women's time garnered 18 points, second fastest got 17 points, and so on. The system accommodates many teams easily while rewarding team depth and speed. Case Crew entered 8 events with 21 athletes and the team won 5 of those events. In two others the team took silver. All-in the team took home 12 medals from the event held in Adelbert Gym on CWRU's campus. These stellar results meant the team reclaimed the Hammer Cup, which was given up to JCU last year by only one point. CWRU now claims the overall record for Hammer Cup wins with 9 total versus 8 for John Carroll and 1 for Cleveland State. Leading the way for the men was freshman Patrick DelBarba with a time of 6:27.9. This time won the Open Men's category and was the fastest time overall at the event. Behind Patrick in the Open race with a time of 7:07.5 was Matt Moss in 5th place. The novice men entered 9 athletes across the heavyweight and lightweight events. For the Open Novice Heavyweights, Matthew Holdren pulled the fastest time of 7:06.6, which was good enough for 2nd place. For the Lightweight Novice Men Willis Mathews pulled the second fastest college time in 6:49.3 ahead of 2nd place CWRU finisher Gavin Brown who pulled 7:21.4. For the women, novice openweight rower Abby Sevier led the way winning her event with the time of 7:50.9. Valerie Mitchel followed her into third place with a time of 8:37.6. On the lightweight novice side, Chloe Milliman pulled 8:26.9, which was good enough for silver and Katie Kershenbaum took bronze with 8:31.0. Varsity rower Caitlin Bowerman finished in 2nd place with a 7:51.8 behind 5'11" tall Lauren Penkala from JCU. The coxswains also got into the mix this year by pulling 1000m. Anna Czekaj won the event with a time of 4:15.4 and novice Ava Kotvas took third in 4:57.3. The last event for the team was the 6x500m relay. Case entered three teams comprised of three women and three men each. The top team won the event in 10:04.2, which was over 20 seconds faster than second place John Carroll. In third was the second team from Case in 10:32.7 and Cleveland State in 4th. The final team from Case took 5th. Race results from the 2012 event can be found HERE. A summary of results from all 18 years of the Hammer Cup can be found HERE. 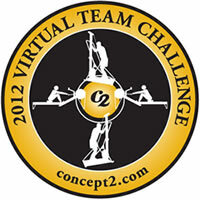 February 3, 2012: Twenty-three alumni & friends pitched in to row 2,387,724 meters in the annual C2 January Virtual Team Challenge (JVTC). For the challenge rowers had to row as many meters as possible between January 1 and January 31 then log their daily meters using the Concept 2 Logbook. The results were then ranked against other teams. The SARA team finished in 47th place out of 330 teams with each member averaging over 100,000m! Thank you to everyone that participated. This year marked the third time a concerted effort was made to log meters for this challenge and the third time we bested our URA rivals from the University of Chicago. We beat their alumni team, but were passed by the students (a separate ranking group) who pulled 100km more meters. Leading the charge for SARA was CWRU Assistant Dean Ken Klika who took top honors with 352,451 meters! Family DelBarba (father Brian and son Patrick) also teamed up to pull a combined total of 490,770 meters. Six people broke the 200km mark and earned a free Case Crew hat – including the first ever alumna to break 200k for the challenge, Kelli Anderson. Let's keep it going next year! January 28, 2012: Case Crew headed to the Steel City for their first 2,000m test in competition at the Pittsburgh Indoor Sprints. The team traveled with a mixture of varsity and novice rowers. Into the mix were freshman Patrick DelBarba and his father Brian racing for Three Rivers. Patrick pulled the fastest men's time of 6:25.3 for the team taking fourth place in the Open event. Earlier in the morning his father Brian pulled a 6:41.6 to take 1st in the 40-49 year old category. Also in the Men's Open event with Patrick were Doug Brubaker with a time of 6:56.2 (15th place) and Matt Moss with 7:13.5 and 19th place. The Pittsburgh Indoor Sprints serves as a satellite regatta for the CRASH-B race in Boston. People that pull a certain "gold" standard time earn a free trip to race in Boston. While no one from the team qualified for a free trip, the official satellite designation draws an incredibly large field of rowers. This year's event drew 600 entries and is in the top ten events in the world. 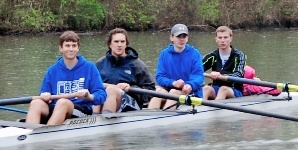 The novice men brought four athletes to Pittsburgh. In the Open Novice category Matt Brown pulled a 7:20.0 and was good enough for 7th place. The Lightweight Novice event had three CWRU participants: Gavin Brown with 7:21.0 and 7th place, Evan Lanese with 7:42.1 and 10th place, and Matthew Steadman with 7:48.5 and 12th place. On the women's side only two athletes pulled 2k. Junior Caitlin Bowerman did her piece in 7:53.2, which was good enough for 8th place. Novice Ava Kotvas then had a go in the Lightweight Novice event and earned 12th place with her time of 10:32.6. For the last event the team mixed it up -- literally -- for the team 6-person relay race. The relay teams of three men and three women completed a total of 3000 meters, or 500m per racer. Case's team consisted of Doug Brubaker, Ava Kotvas, Matt Moss, head coach and alumna Patty Wolford, Caitlin Bowerman and anchored by Patrick DelBarba. The team's time for 3k was 10:30.2, which placed them 8th overall out of 13 teams. You can watch a YouTube video of the relay here. In the collegiate team points competition, the team finished in third place behind the University of Pittsburgh and Carnegie-Mellon University. January 21, 2012: John Carroll hosted Case and Cleveland State for a friendly round of Anaerobic Threshold testing with the Case Men claiming top honors along with the team winning the overall title. The previous two years had only Case and JCU racing each other, but the teams invited Cleveland State to the party this year. The teams raced over 5,000 meters (women) and 6,000 meters (men) with each rower awarded one point for each rower they beat. Then the points were tallied to crown a winner overall and for the men and women. JCU won the women's crown. The men showed up in force and dominated their event. The nine men from Case were led to victory by freshman Patrick DelBarba with his winning time of 20:47.5 (1:44 splits). Novice Willis Mathews pulled 22:44.9 for the second fastest team time and 4th overall. Half a second off Willis was Doug Brubaker in fifth and Matt Moss in sixth with a time of 23:05.6. Five other men's novices (Matthew Holdren, Gavin Brown, Matt Steadman, Evan Lanese and Edwin Bernardoni) also competed gaining valuable racing experience and capturing 14 points for the team. The men's team doubled JCU's point total with 62 points. JCU finished with 31 points while Cleveland state were awarded 27. The Case women's ranks were thinned by an event on campus. However, the top three scores on the team garnered spots two through four putting them only 27 points off JCU who brought 9 athletes to the event! Junior Caitlin Bowerman pulled a 20:50.5 5k (2:05 splits) finishing 2nd behind Lauren Penkala of JCU by 2.5 seconds. Caitlin was followed by law student Ruth Dickey with a time of 21:08.7 and novice Abby Sevier with a time of 21:12.4. Rounding out the results was novice Ava Kotvas' time of 27:52.4. After combining points from both teams Case was declared the overall scrimmage winner with 95 points against John Carroll's 77 and Cleveland State's 39. The event is a fun tune up for both teams. Next up for Case is the Pittsburgh Indoor Sprints next weekend and then the Hammer Ergatta on February 11. If you're around please go and cheer the students on! October 29, 2011: Case Crew took a full squad of 30 athletes -- varsity & novice -- to Harsha Lake in Cincinnati to take on the Hidden Dragon. This new regatta hosted by Clermont Crew winds along the lake (hence the dragon reference) for 5,000 meters. A glorious fall day met the team as they competed against local colleges Wittenberg and Xavier. The team entered a total of 14 crews and walked away with gold in 5 events included 2 events where they went gold/silver. 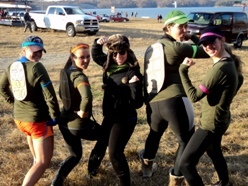 The late fall date of the regatta coincided with Halloween so participants were encouraged to dress up. Check out the photo album to see some of the costumes, but the highlight must have been the women's varsity four of Ruth Dickey (s), Caitlin Bowerman (3), Mallory Miller (2) and Grace Eder (b) dressed up as the Teenage Mutant Ninja Turtles. Not only were their outfits awesome their time over Xavier was awesome taking the gold by over 2.5 minutes! In other women's varsity racing Mallory Miller and Grace Eder took 4th in the women's open double and Ruth Dickey and Laura Kruse also took 4th in the open pair. For the novice women, the team boated two crews in the four and split Xavier taking 1st and 3rd. The women then jumped in the novice eight, but struggled to find their speed finishing second behind Xavier by almost 3 minutes. On the men's side everyone came home with hardware! The varsity men entered two fours and took gold and silver. In the varsity pair the guys also took gold and silver. Reprising their line up from the Charles Doug Brubaker and Patrick DelBarba crushed Wittenberg by three minutes in the open double. The novice men in the 8+ finished a little over a minute behind Xavier but ahead of Wittenberg to claim the silver medal. The guys then split into two novice fours and finished in 2nd and third behind Wittenberg (but ahead of Xavier). The team's coaches also got into the act with Bob Gannon taking gold out of 4 scullers in the Masters 1x. The he and Patty Wolford Travis stepped into the mixed double and beat Greater Dayton Rowing Association by 2.5 minutes to take gold. Before racing started in the morning the regatta organizers hosted a 5k run along the lake. A number of Case Crew rowers competed with Novice Katie Kershenbaum taking the 16-19 year old event in a time of 25:54.76. From the varsity squad Mallory Miller took top honors in the 20-35 age category with a time of 24:16.27. On the men's side novice Patrick Delbarba took second place in the 16-19 year old event with a time of 25:13.94. Full results can be found with the link below. All in all it was the perfect cap to a great season for the team. The varsity claimed more medals than any fall team in recent memory and the novices got to race twice claiming medals at each race. Now the team heads indoors and we look forward to an exciting spring season! Case Crew Takes on the Charles! October 22, 2011: Case Crew entered three boats into this year's Head of the Charles: the Women's Club 4+, the Men's Championship 2x and Miranda Cullins in the Champ Single. The Saturday weather could be classified as "classic" fall weather with the sun beating down, cool temperatures and fast racing in Boston. The crew of Ruth Dickey (stroke), Caitlin Bowerman (3), Mallory Miller (2), Grace Eder (b) with Anna Czekaj coxing finished 24th out of 45 and just missed a qualifying spot for next year. To qualify crews have to finish in the top 50% in terms of position. However, this year's club 4+ event was incredibly fast overall. The Case women posted the fastest time ever (% time off the winner) for any Case entry at the Charles -- men or women. They finished within 6.63% of the winning crew from Boston University, but even that fast time was still outside the top half of crews. The second fastest crew in team history was men's collegiate 4+ in 2007 that finished 7.52% off the winner. CWRU Women's Club 4+ sporting the Deere hats and Cleveland skyline tanks! Also in the club four event were crews from WRRA and Endicott College. 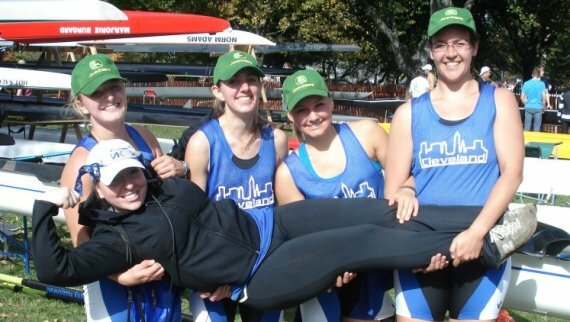 A healthy cross-boathouse rivalry has developed between the CWRU and WRRA women. The extra motivation paid off with WRRA finishing 6 places behind Case. The Endicott head coach is Brian Chorney '07 and his crew finished in 41st. Club President Doug Brubaker and Patrick DelBarba entered the Championship Double and tried their hand against many members of the current and former national teams. Their time of 18:40.46 was good enough for 17th place out of 21 crews starting the race. Their time was 13.54% off the Graves brother from Craftsbury Sculling Center who competed in the Senior World Championships 6 weeks prior. Also in the race was Tim Marcovy's son, Aaron, racing for Vesper. The Vesper crew struggled with steering and finished in 8th place. Miranda Cullin's entry into the Championship Single was a bit of a surprise. She was waitlisted initially but then the organizers called to say a spot was open only a couple weeks before race day. She had moved back to Cleveland this fall from the Princeton Training Center to continue work on her PhD at Case, but decided to make the trip to Boston. In a field stacked with national teamers from four countries she finished 22nd out of 25. To give you an idea of the speed in the event the 4th place person, Margot Shumway of Potomac BC, had just won the Pan Am Games in the single the weekend before. The evening after racing the team continued the tradition of meeting alumni after the racing. SARA Secretary and Boston resident, Brian Chorney, made arrangements to meet up at the Sunset Grill & Tap in Allston, MA. October 21, 2011: Doug Brubaker '12 is featured in the October 21 edition of The Observer, the student newspaper at CWRU. Doug is the Case Crew president from Powell, Ohio. He has been rowing for two years and became president this fall, and will be racing this weekend at the Head of the Charles in the Champ Double. Click here to read the Spartan Spotlight article about him (or here for a pdf version of the article). October 15, 2011: Case Crew traveled to Columbus, Ohio for the 28th annual Jack Speakmon Memorial Regatta on Griggs Reservoir. This regatta has traditionally been the end-of-season bash for the team, but Greater Columbus Rowing Association has chosen the weekend before the Charles for the last two years. The coaches had watch the crop of novices progress well the last couple weeks and so they brought the whole squad. The team entered 11 events and medaled in 7 making this the most successful Speakmon in team history! Conditions were sunny and cool, but the story of the day was the wind. Steady winds of 10-12 mph blew throughout the day and gusts of up to 30mph were felt. With over 500 entries in this years regatta competition was deep and the crews that found their speed in the wind walked away with hardware. Leading the team on the water was freshman Patrick DelBarba who grabbed gold in both the Men's Open 1x and with his partner and club president Doug Brubaker in the open 2x. Patrick and Doug then jumped in the mixed four with Rachel Wilson and Laura Kruse to take silver in that event. 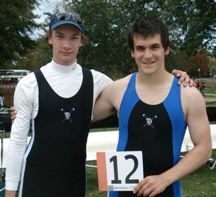 Patrick and Doug will be heading to Boston next weekend to compete in the Champ Double in the Head of the Charles. On the women's side the novices all walked away with hardware. In the novice 8+ they split two Ohio University to take silver and in the novice 4+ event the lineup of Milliman, Kotvas, Kershenbaum, and Hart also took silver ahead of teams from Ohio University and Cleveland State. The women's varsity team entered the 4+ and pair events. The women's varsity 4+ of Eder, Miller, Bowerman, and Dickey struggled to find their speed but finished a respectable 5th. The four faster crews from Ohio State and University of Dayton were all varsity program athletes. This women's four will also be competing in Boston next weekend. In the pair recent alumna Katie Puttmann made her way back to reprise the combo with Caitlin Bowerman. This duo won the event at Speakmon last year and also made the finals at Vails. A few months away didn't dampen their speed and they were able to score bronze this year behind crews from Upper Arlington High School and Saline High School. Law student Ruth Dickey paired up with Laura Kruse to race the pair and took 9th in the same event. For the rest of the men's crews the highlight was the men's novice four. Having never touched an oar before Labor Day the crew of Shin, Steadman, Krajci, and Travis took the silver medal behind a fast crew from Indianapolis Rowing Center. The novice men's four then joined forces with the varsity men's four to try out the 8+ but finished 5th out of 5. Other results from the men included a 5th place finish in the Open 4+ and 4th in the Frosh 8+. In other racing, assistant coach Bob Gannon and SARA board member Tim Marcovy jumped in their singles for the master men's race. Bob took 4th out of 19 crews while Tim finished 9th. Certainly one of the highlights of the day was the christening of the newest shell in the Spartan Navy -- the Stefan James. The shell , a Pocock Hypercarbon 4+, is the first "true" lightweight crew shell at the team's disposal and is a great addition to the fleet. Past Case Crew president and current SARA VP Dan Bachmann '97 MED'02 led the donations for the new shell and named it after his brother. 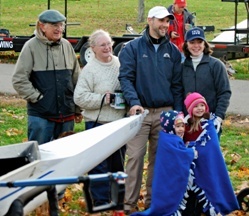 Dan's wife is also an alum of Case having graduated with him from Case Med and wholeheartedly supports his rowing habit. They live only a couple miles from the Speakmon course and so turned out for a little spilling of Champaign. The shell is part of the Alumni Victorious Campaign, which was started by SARA in 2008 to help bolster the equipment and coaching resources for the team. You can view more photos of the boat dedication here. October 1, 2011: The rowers were greeted by inclement weather and a new course this year in Pittsburgh for the Head of the Ohio. With temperatures in the 40's and 50's and scattered rain (check out some of the W4+ photos) the team raced mostly small boats over the 2.6 miles. Overall the team grabbed a gold medal in the women's lightweight double and silver in the open men's single. In the men's pair the combo of Doug Brubaker and Matt Moss missed the medals by only 3 seconds. Grace Eder and Mallory Miller continued their form from the Head of the Cuyahoga where they won the Open Double event. In Pittsburgh they beat Xavier University to win the Open Lightweight event. The other women's crews struggled to find their form. Conditions, doubling up, and a long wait at the start in the cold took their toll. The women's 4+ of Grace Eder (bow), Mallory Miller (2), Caitlin Bowerman (3), Ruth Dickey (stroke) with Anna Czekaj (cox) finished 14th out of 22 crews. The women's four finished just behind cross-town rivals John Carroll, but beat both entries from UAA rivals Carnegie-Mellon. Earlier in the morning Caitlin also teamed up with a new partner, Laura Kruse, to try the women's open pair where they finished 5th. The men's team was led to the podium by freshman Patrick DelBarba in the Open 1x where he garnered the silver medal. 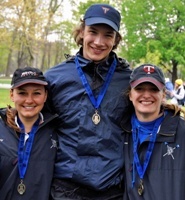 Patrick is an experienced sculler from Three Rivers and is studying Computer Science at Case. Patrick also raced in the Open Double event with club president Doug Brubaker where they finished 4th. The men's team decided to race two pairs this year instead of the four. The "A" line up of Doug Brubaker and Matt Moss finished 4th and only 3 seconds out of the medals. They were paced by strong crews from Carnegie Mellon, Three Rivers and the University of Cincinnati. In the "B" line up Jeff Chin and Nicholas Miller finished 7th ahead of crews from North Catholic High School and Carnegie Mellon's second entry. For the first 24 years of the regatta, the course started upriver near the Three Rivers Rowing Association boathouse on Settlers Landing and finished downtown near the football stadium. Due to space constraints, the organizers switched directions and this year crews raced against the current from downtown to Settlers Landing. The same 2.6 miles along the Allegheny River were covered, but times were significantly slower this year. However, with this new format some of the kinks still needed to be worked out. Crews sat at the start more than normal in the cold and the logistics around the dock will need to be improved. Fortunately, a number of parents were on hand to help out. Thanks to families of Patrick, Doug and Mallory for being around to help! And thanks to Danette Bush for all of the great photos and enduring such a soggy day with her camera! In other racing, Coaches Patty Travis (Wolford) and Bob Gannon brought home numerous medals including a silver together in the Mixed Master 2x. Former coach and current SARA board member Tim Marcovy also raced a couple times bringing home medals in the Masters Quad and Eight. Case Crew founder and SARA board member Tom Hudak raced to a dominating win in the Open Quad racing for Three Rivers. 2011 HOTC Recap: 6 Medals and a Charles Bid! 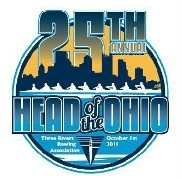 September 17, 2011: The 16th running of the Head of the Cuyahoga was the first at the new Rivergate Park in Cleveland. With cool, sunny fall weather greeting the rowers, the new Cleveland Rowing Foundation boathouse played host to a great event that featured Case Crew winning 4 gold medals and 1 silver! The most anticipated event of the day was the Women's Varsity 4+. The women's team was originally told they would get CRF's bid into the illustrious Head of the Charles Regatta. However, a few days before the Head of the Cuyahoga crews from both John Carroll and WRRA said they wanted the bid too. Solution -- race off! The winner in Cleveland would get the chance to race in Boston. Coach Patty Wolford shuffled the line up and prepared her women to represent. SARA kicked into the effort by getting the new four delivered the day before the race. Combine a fit crew and a brand new, world class shell and good things happen. 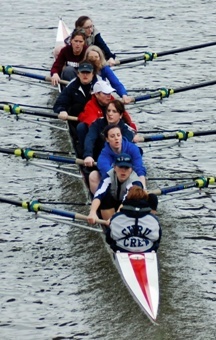 The Case Crew women bested their rivals from JCU by 11 seconds and WRRA were over 30 seconds off the pace. Decision made -- Case is officially in the Charles! The win in the Women's Varsity 4+ also garnered the team the Marcovy Cup. For those of you "in the know" the Marcovy Cup is a bronzed tennis shoe from Case Crew coach emeritus Tim Marcovy. It's big and strange looking -- and absolutely great! The cup has been awarded since 1990, and this win is only the 2nd ever for Case Crew. Well done ladies! With the novices only joining the team a week or so before the race, the Head of the Cuyahoga is varsity only affair. It is also a test of how well the rowers stayed in shaped over the summer. 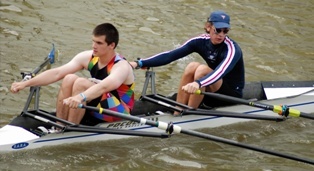 Aside from a number of masters club rowers that often enter open events, a number of colleges also took part this year. Of course, John Carroll and Cleveland State entered crews. But also teams from Miami University, Xavier University and the University of Toledo made the trip to northeast Ohio. Summer fitness proved to not be an issue with the team taking gold in the Women's Open 2x, Women's Open Pair and Men's Open 2x events. For the men Doug Brubaker and Patrick DelBarba teamed up in the men's double to win against a Cincinnati Rowing Club entry. Doug and Patrick will also be teaming up in the Champ Double event at the Head of the Charles joining the women in the four. Up until this weekend the men and women have been sharing the "fast" four hull donated in 2008 by SARA. Both the men and women have rowed the Hudak to numerous medals in the last couple years, but with tight regatta schedules it's not always possible to boat all varsity crews in this beatiful hull. Problem solved! With SARA's leadership the team took delivery of a proper women-specific Hypercarbon 4+ from Pocock the day before the race (see women's 4+ photo above). The team now has a "complete" fleet with two 8's, three 4's, two pair/doubles, and a few singles. For the foreseeable future we should now be in a mode of replacement, which is much more manageable from a financial perspective than buying new shells without trade-in. More importantly, the team now has a level of equipment worthy of their efforts and the coaches now have the flexibility to boat crews in hull appropriate to the rower's skill levels. Aside from boat turnover and maintenance SARA's next focus is providing a permanent base for coaching through a university endowment. The Men's Four line up of Owen Bell (b), Jeff Chin (2), Doug Brubaker (3), Matt Moss (s) with Anna Czekaj (cox) rowed a strong race to finish 5th in a fast event. The winner from Miami University posted the fastest four time of the day taking home the Ivanhoe Boat Club award. Case rower Nicholas Miller also jumped into the pair with a friend from St. Joseph U and finished 2nd behind Three Rivers Rowing. The women and men then joined forces to win the Mixed Open 8+ against four other college crews. The closest crew was Miami 14 seconds off the pace and 3rd place crew CSU over 2 minutes behind. If you take a look at the team photo section you'll see some of the rowers with three gold medals. One heck of a result! Click here for an article in the Case Daily (html) or here (pdf).